We’re aiming to develop a partnership between the University of Rhode Island’s Harrington School of Communication and Media Library and Information Studies (GSLIS) program and the Providence Children’s Film Festival with support from the Rhode Island Office of Library and Information Services (OLIS) on a two-year project designed to advance the digital and media literacy competencies of children, teens, and families in our communities. A series of public programming events for children, teens, and their families emphasizing the use of film and media texts and digital media tools and technologies to promote expanded literacy in the 21st century. These programs will draw upon a deep connection with the Providence Children’s Film Festival. A series of continuing education workshops designed to create a cadre of digital and media literacy expert librarians and educators. 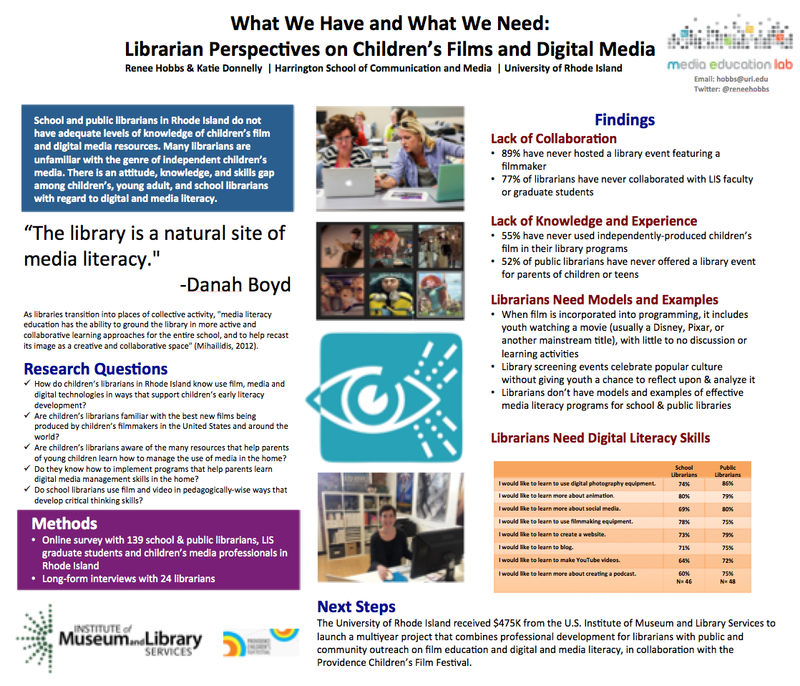 A revised LIS curriculum for school and public librarians that includes an emphasis on digital media literacy and experiential learning through community collaboration. An online resource hub that includes information on events, video excerpts from public programming and training events, curated lists of developmentally appropriate media texts, film screening and discussion guides, digital media literacy lesson plans and activities, “how-to” guides on digital media literacy competencies, and a database of articles and other resources, created by current graduate GSLIS students spearheading a national conversation about digital and media literacy in libraries. Thanks to Katie Donnelly who spearheaded the planning process from start to finish, with support from Media Education Labster Morgan Jaffe. We were honored to have RI State Librarian Karen Mellor and Anisa Raouf, Executive Director of the Providence Children’s Film Festival as key partners in imagining the synergistic possibilities for this program to advance digital and media literacy at the state level by supporting the work of teacher-librarians in Rhode Island schools and youth-serving public librarians across the state (and across the nation). National advisors included Caitlin Barry, Westside Neighborhood School, Cen Campbell, LittleeLit.com, Shelley Diaz, School Library Journal, Joe Douillette, Institute of Contemporary Art Boston, Nicole Fenichel-Hewitt, Children’s Media Project, Cathy Gourley, Author and Curriculum Consultant, David Kleeman, PlayCollective, Dr. Kelly Mendoza, Common Sense Media, Brian Puerling, Catherine Cook School, Dr. Michael Robb, Fred Rogers Center, Dr. Faith Rogow, Insighters Educational Consulting, Deborah Aubert Thomas, Media Literacy Consultant, Dr. Joyce Valenza, Rutgers University, and Dr. Alice Wilder, Remake Learning. Local advisors included Eric Bilodeau, Providence Children’s Film Festival, Brien Jennings, Narragansett Elementary School, Dr. Cheryl McCarthy, Graduate School of Library and Information Studies, University of Rhode Island, Joan Mouradjian, Narragansett Pier Middle School, Tanya Paglia, Barrington Public Library, Susan Sabella, Narragansett Elementary School, Cheryl Space, Office of Library and Information Services (OLIS), and Jen Thomas, Dighton-Rehoboth Regional High School. We were also delighted to have support from Connie McGreavy, Karen Markin, Franca Cirilli and Annette Hillman at the University of Rhode Island’s Office of Research and and Economic Development. Thanks to all of your for sharing your time and talent! As we brainstormed and planned this program, we aimed for a simple but powerful goal: to help the people and families across the state of Rhode Island to be more aware of the importance of digital and media literacy and the role of libraries in supporting these essential skills. Here at the Harrington School, we’re eager to enable LIS graduate students preparing to become school and public librarians to develop relevant knowledge and competencies and learn to curate and create media, as well as collaborate and advocate in communities. We’re thrilled about the possibility that we’ll get to support RI librarians who participate in continuing education will to gain competencies in digital media literacy that enable them to fully exploit the power of film and digital media as a resource for children, teens, and families—giving them the knowledge and skills they need to bring practical programs that engage, inspire, and stimulate lifelong learning.